Last week, we talked about living our whole lives in the context of praising God. This study is directly related to that, and I want to begin by quoting a scripture that I almost referenced in that post but decided to save until today. I don’t know about you, but I know that right now my life isn’t at the point where I can say that every single thing I do is done with the intention of bringing God glory. But that is part of our goal while we are here on this earth. Every aspect of our lives should be contextualized by our relationships with God and Jesus. “Every thought”? That’s a tall order. It’s a bit less daunting, though, when we remember Jesus Christ’s words to the disciples in Matthew 19:26 — “With men this is impossible, but with God all things are possible.” Self-control is also one of the fruits of the Holy Spirit, so we know that it is attainable with God’s help (Gal. 5:22). I also suspect that, while there may be some days when we literally have to battle every thought, that it gets easier. The closer we grow to God, the more automatic it will be to think and act like Him. Christ Himself is being formed in us (Gal. 4:19), along with His mind and thought processes (Phil. 2:5). Letting, inviting, asking Him to dwell in us is a step toward living all our lives for God’s glory (John 15:4, 8). If we go back to the beginning of Colossians 3 to get context for the verse we just quoted, we find an interesting introduction to a passage that talks about putting to death our sins (verse 5) and putting on the new man who looks like Christ (verse 10). If we really are living as if we are dead to the world and our only life is wrapped up in Christ, of course we’ll be living for His glory. Earlier, I suggested that we should be growing to the point where reacting in the same way that Christ would respond is automatic. If we struggle with anger, for example, it might still be our first impulse but we should be becoming more practiced at replacing it with love. C.S. Lewis had this to say about what first impulses can tell us about ourselves. As we mature as Christians we should be quicker to recognize our tendencies to sin, and with Christ in us we now have the power to resist temptation before it becomes sin. It is imperative that we be aware of and active in this process. We cannot passively overcome sin. As human beings, we can’t be without a “master” — we’re either serving sin, or we’re serving God (Rom. 6:16-23). If we’re serving God in “obedience leading to righteousness,” then we’re also making conscious choices to not obey, or yield to, sin. When Jesus Christ died for us, He ransomed us free from servitude to sin. We belong to Him, not to ourselves. Acts 20:28 describes the Church as “purchased with His own blood.” Peter says that false teachers who spread “destructive heresies” are “even denying the Lord who bought them” (2 Pet. 2:1). It is important that we recognize, rather than deny, this fact. Jesus’ incredible sacrifice cleansed us so that we could “serve the living God” (Heb. 9:14). He made a relationship possible between us and our creator. He established a new covenant “on better promises” that offers us eternal life as part of God’s family (Heb. 8:6). We don’t belong to this world or to Satan or to ourselves any more — we have been ransomed away from slavery to sin and to our own individual weaknesses. We now belong to the One who ransomed us, as His servants, His friends, His bride, His family, His body, His church, and His temple. Our physical bodies and our spirits — the intangible part of that makes me “me” and can communicate with God’s Spirit — belong to God. This fact does not, however, mean that we don’t have free will. Even within the choice to follow God (and it is a choice), there are many other choices we’ll have to make. I’ve been talking about this in relation to careers with a new friend I met through this blog. Our latest e-mails brought up the idea that God doesn’t care so much what you do to earn a living (with, you know, the obvious exceptions of earning money in a way contrary to the laws of God and man) as He cares how you conduct yourself in your work and whether or not you’re growing close to Him. Returning to 1 Corinthians 10:31, which opened this post, the context is whether or not Christians could eat meat that was sacrificed to idols. That’s not really an issue for us today, but there’s still a lesson we can learn. Paul says it’s okay to eat or not eat this kind of meat, so long as the way you conduct yourself glorifies God. Either choice was morally and legally acceptable before God on its own. But because we belong to God, Paul says that our choices need to be examined in the light of “will it bring God glory?” and “will it profit my brethren?” In the same way, once we answer the question, “can I, or can I not” do something legally in God’s eyes, we should then ask, “should I , or shouldn’t I?” It’s a matter of where our hearts are, and what is our motivation. This same topic is also discussed a few chapters earlier in 1 Corinthians, and that passage adds an even stronger warning. That is serious. When our choices, even if they are perfectly acceptable based on our own knowledge, hurt our brethren, it is a sin against Christ. It’s the seam idea expressed in Matthew 25 — “inasmuch as you did not do it to one of the least of these, you did not do it to Me” (Matt. 25:41-46). It’s not enough to act based on knowledge of God’s laws, though that is certainly important. 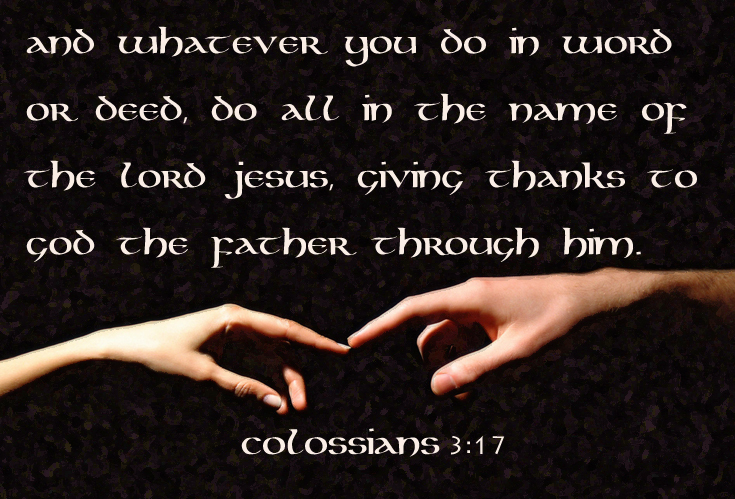 We must also be acting based on love, which builds up our brethren, and for the glory of god (1 Cor. 8:1-7).